A long interview with Francis appeared on the MyLondon website on 1st February, titled "The former rock 'n' roll wildman who now loves living a 'very boring' life in Croydon" and written by Frederica Miller. "Back in the 70s and 80s Status Quo were huge. Like, opening Live Aid huge. If you're too young to have heard of them, ask your mum! He's reported to have blown a whopping £1.7 million on cocaine. But he's now 69 and he's mellowed. To an astonishing degree. Born and bred in South London, he chatted to MyLondon this week about his life on Croydon's exclusive Webb Estate, where he has lived since 1975. "I've got little old black and white pictures of Purley, Croydon, Coulsdon - they're stuck to my wall. "I've got pictures of East Croydon station as it was. It's just tremendous. I remember [all of that] from my childhood because we grew up in that black and white, post World War Two [era where it was a] smoggy s***hole of bomb sites. Far from rock 'n' roll, Rossi describes his life in Croydon as "very regimented". It wasn't until much later in life that Rossi moved to Croydon, though, after falling in love with Purley's Webb Estate. He explained: "In the 1970s my manager lived in Buckingham Way and I was down to see him and was driving around and thought 'I like it here'. "And then I turned into the Webb Estate, I saw it and I was only 21 or 22 and it made me aspire to do well in the capitalist way. I thought 'earn money and you'll be able to live there' - and I did that." It's a gated community full of multi-million pound mansions. It is close to exclusive private schools and even has a quaint tea room, The Lord Roberts, which was transformed from a struggling post office by Channel Four TV presenter Laura Hamilton. Rossi said: "There are so many places going up everywhere [else] and I can't cope - and you actually sound like your fricking grandparents or your parents and you swore blind you'd never do that. "I like the Webb Estate because it's still pretty secluded. I just fell in love with it when I was younger and I'm a person of not too much changed. "I stay at home as much as possible, indoors. I've never had a rock 'n' roll party while living here. They [his neighbours] were very lucky, people used to complain about things when I first moved in, but they were just lucky it wasn't [his late bandmate] Rick (Parfitt). "Rick loved to do that - but we were opposites like that. I really don't like parties or gatherings, not at all. I'm a very boring person really - I mean really. "I don't drink, I never drank when we toured when I was younger. But there was a period when we were in Switzerland recording somewhere and we went to a Mexican restaurant and everyone said 'go on, be a man, have a drink' and I think I had about six margaritas. Not very manly. And drinking led me to cocaine and then, I still don't like drinking, so I don't do it. "The Webb Estate is perfect for me because it's boring." Rossi's subdued lifestyle seems to extend to being on tour these days. While Rossi doesn't like to let loose on tour he does enjoy visiting restaurants in Croydon. He said: "Osushi's (in South End) is my favourite but I also frequent Bagatti's and Navaratna. Osushi's is run by a British-born Chinese guy and a Vietnamese guy. I've been going there about 11 years and it's fantastic. I go as frequently as possible, I'm addicted to sushi." Of Rossi's eight children, four still live at home while the other four live nearby in South London. Rossi said: "I like them being at home and I like them being nearby. It's an Italian thing, we all sort of live in one big friggin' house." But fame and fortune doesn't come without sacrifice. Rossi explained: "You have to be so cut throat. All I've ever done is focus on this to the detriment of my children's lives, they barely know who I am I suppose. I'm lucky my wife allows me to do so much. I'm obsessed with my job - and still am. "I remember my dad telling me, he ran a shop, that you never ever don't make it into work - even if you're feeling unwell, you've got to. Work never goes away, my mind's always working." While Rossi maintains he's constantly working he does find rare moments to unwind and loves doing jigsaws and crosswords. He explained: "I find puzzles very therapeutic, I do my jigsaw puzzle every afternoon. I do a lot of Mike Jupp who does strange crazy scenes. I'm not someone who does jigsaws or crosswords as a challenge. I enjoy it, I do the Times and the Guardian each day and work on a 1,000-piece puzzle. "I don't think much about work at that time, it'll be finished by this afternoon and then I'll try and start another one." Rossi has a studio in his garden where he's been practicing in preparation for the tour. He said: "I tend to start at 10 in the morning and I finish at five, then I work out, I eat at six, then I do a bit of the puzzle then I practice for an hour or two and then I play patience and go to sleep again - I'm very regimented." Rossi's tour will feature music from his We Talk Too Much album and he will be joined by vocalist Hannah Rickard. There will also be stories from his I Talk Too Much autobiography. He'll be bringing the tour to Hayes's Beck Theatre and Bromley's Churchill Theatre as well as dozens of other UK locations." 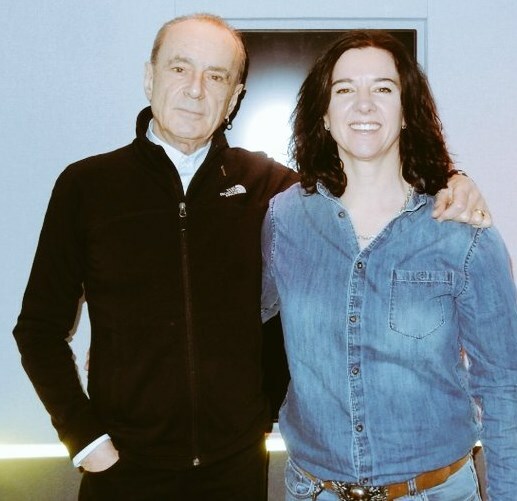 Francis was interviewed by the Watford Observer newspaper and the interview was published on 9th February, titled "Rock royalty Francis Rossi to host music night in Watford" and written by Rory Butler. "The phone rings several times before Francis finally answers. This is my second attempt. When he does there’s a beat before he starts singing: “I’m sorry I’m late, I’m so sorry I’m late (chuckling)... No but really I am sorry I’m late.” I’m fairly certain these lyrics are entirely original. The I Talk Too Much tour will land at the Watford Colosseum on April 27. Francis will also be signing copies of his album, We Talk Too Much - due for release on March 15 - and his book written with Mick Wall after the show. His autobiography, I Talk Too Much, is due out on March 14." Francis was interviewed by Andy Snowden on the "Stage & Screen Show" on Calon FM on 9th February, as yet another promo for his spoken word tour, book and album with Hannah Rickard. True to his word, Francis talked a lot and the interview ended up lasting about 35 minutes. The interview was immediately preceded by Jackie Lynton’s "Live" album introduction before Andy reeled off some Quo history and vital statistics. Discussion started off with Quo's longevity, with Francis saying he's "approaching 70...and I just keep going" and noting how much he now appreciates seeing multiple generations in the audience. The first Top Of The Pops appearance came next and Francis said that he already felt "grown up at 19" by being on that show and he also confirmed the story about writing "Pictures of Matchstick Men" on the toilet. The track was then played. Inevitably, Francis mentioned the "insecure little show offs" in show business (including some DJs in that!). He thought "success" with the first hit would change everything, but really "nothing changes". He pointed out that it's part of the human condition to look forward to stuff, but that's often the best bit and better than what actually eventuates. Francis said it's the same with gigs, so he treats them all the same because if he looks forward to it, then the gig never lives up to it. He mentioned that he finds it particularly strange that people say your wedding day will be the best day of your life! Talking about Live Aid, he said he just wanted to "get on and get off" and he couldn’t even remember which songs they played! When talk turned to the recent Frantic Four reunion shows, he said he was "very embarrassed by it" and they "could have been a lot better", but he recognized the outpouring of emotion and nostalgia. He said it was "very difficult musically" and he "was really glad we did it and that [Alan and John] earned the kind of money they did". Moving on to Rick, he said that other people "will never understand our relationship, I never will and I was there!" He told a story about one of their first gigs, where Rick mimed and almost got sacked from the band - I've never heard that story before! Francis repeated that he and Rick were "very close" in the early days and that "there were turbulent times and there were fabulous times" over the years since. Andy has interviewed Richie Malone twice since he joined the band and this interview turned to talking about him. Francis said it was "destined to be" in terms of Richie replacing Rick and that he is "a delightful bloke". He said he understands the people that don’t want to see Quo now, but he believes there's "something special and it’s not all down to the Irish git"! Eventually, they got to promoing the book, album and spoken word tour! When Andy asked about a Christmas tour, it was an emphatic "no" unfortunately but Francis did say there's a "possibility of an album" so it wasn't all bad news. The interview concluded and played out with "Under The Influence". Francis was interviewed by Leona Graham on Absolute Radio on 24th February. Rhino's Revenge performed at The Guitar Show 2019 on 24th February. The show was held at Birmingham's New Bingley Hall on 23rd and 24th February. Along with drummer Richard Newman and "special guest" Freddie Edwards, Rhino's Revenge played a short live set on Sunday afternoon preceded by a short interview. Rhino then signed autographs and chatted at the Rockano Productions stand (manufacturer of the guitar Facelift product). Some photos of the band in action can be seen on their Facebook page.